The Chattanooga DTS Spinal Decompression System is a leading non-surgical treatment for disc related syndromes of the neck and lower back. The system employs sophisticated equipment manufactured by the Chattanooga Group, the world's largest manufacturer of rehabilitation equipment. The Chattanooga DTS Spinal Decompression System is the most popular decompression system with over 1,200 installations worldwide. 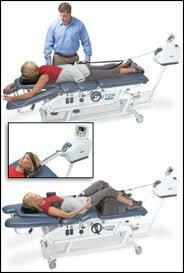 It provides the versatility of performing both neck and lower back decompression within the same system. Instead of merely decompresses a general area of the spine, it targets specific level of the herniated disc and “senses” if the body is resisting traction. The Chattanooga DTS is able to lessen its pull to maximize decompression of the disc. This process occurs several times per second, reducing the body's innate response to fight traction thus eliminating muscle spasms. The Chattanooga DTS safely and gently stretches the spine at a proper level and angle so that the herniated material can be drawn back into place. While decompression is taking place, blood and nutrients rehydrate the herniated disc, allowing it to heal and attributing to its high success rate! At Healing Touch Chiropractic & Rehab, we are dedicated to offer the latest, state-of-the-art therapies for treating pain in the neck, low back, sciatica, leg pain and herniated or degenerative disc diseases. We believe the Chattanooga Spinal Decompression System to be the most advanced, non-surgical and pain-free treatment method for our patients.